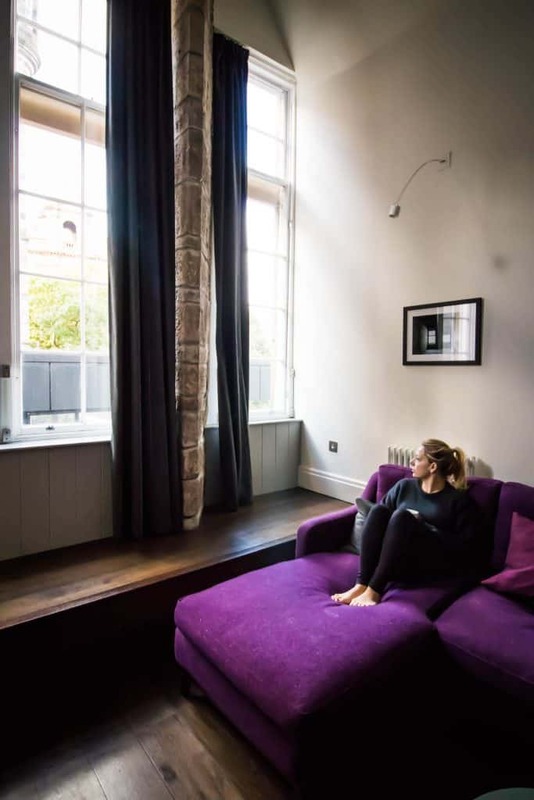 Blog Where To Stay In Edinburgh: Our Favorites! Scotland’s capital city, Edinburgh is no doubt a popular tourist destination. However, with all of those tourist means it may be difficult to figure out where to stay in Edinburgh. The city is packed with history, parks, cafes, shops, and restaurants. We found ourselves constantly wandering around the city finding new amazing places. Our days were packed full with the things to do in the city. So, when it the end of the day came we needed a great hotel to lay our head at night. 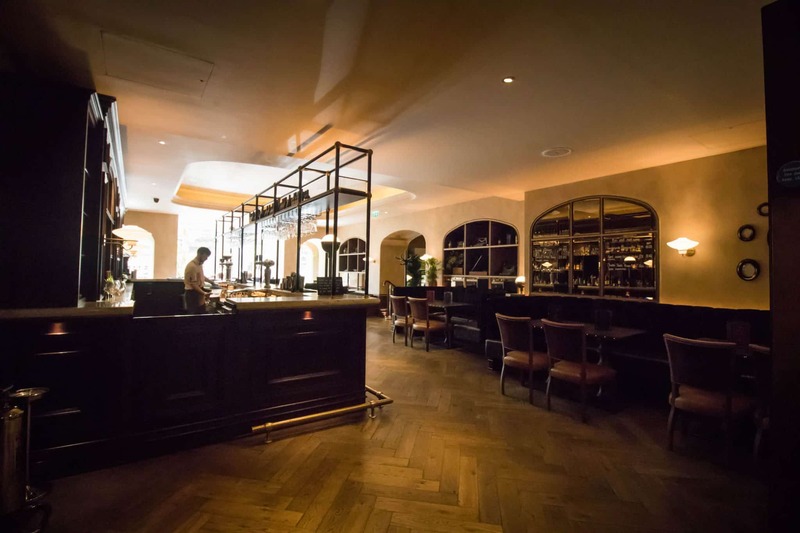 We spent over a week in the historic city and set about seeking some of Edinburgh’s best hotels and restaurants. 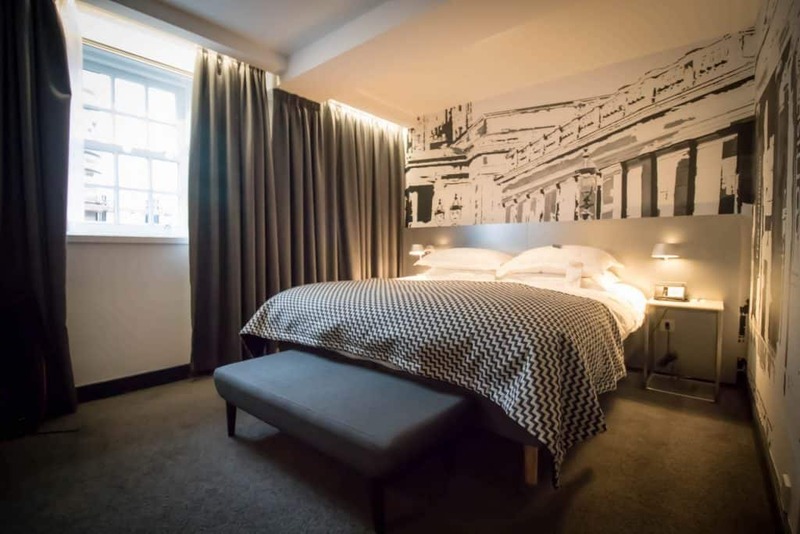 If you plan on making it to Scotland’s capital city then we suggest booking in advance as the good places can stay booked up year round in a city like this.There is no shortage of accommodation in a city that has been serving tourist for decades. However, there are definitely not so great places and amazing places to stay in Edinburgh. Here are some of our favorites! If you’re the type who likes to feel at home when traveling than look no further. 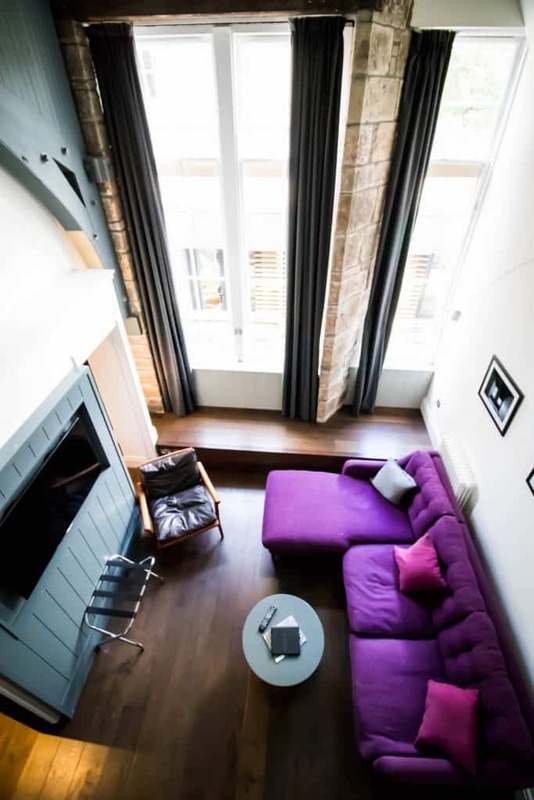 Old Town Chambers is a collection of luxury apartments in the heart of Edinburgh’s Old Town. The apartments are modern, spacious, comfortable, and definitely luxurious. The interior of the apartments seamlessly blend the historic and the new. The exposed brick, steel beams, dimmer controlled lighting and modern furniture all work. Each unit comes with a fully stocked kitchen, including a Nespresso machine for those feeling in a George Clooney mood. Our apartment had a large kitchen table that left enough room for friends to enjoy drinks and dinner. The two bedroom unit featured a loft with views out over the North Bridge. 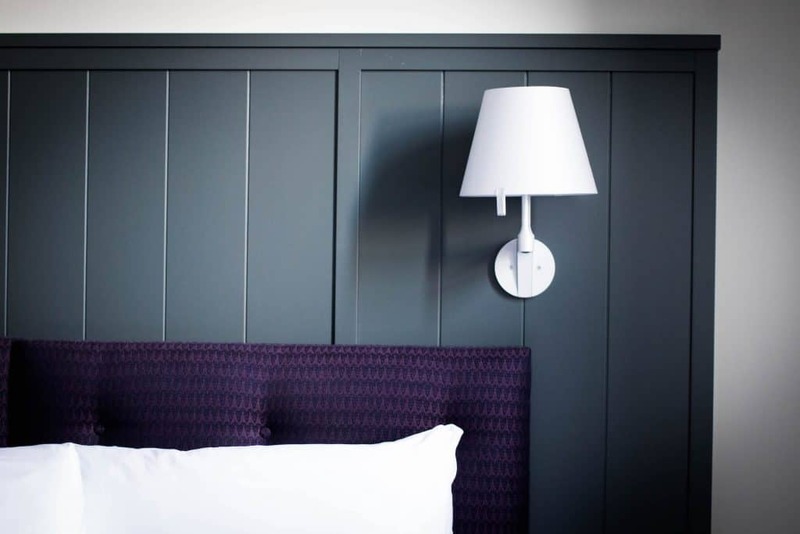 And when it comes time to sleep you won’t be disappointed as the beds are comfortable with nice linens. Bathrooms are modern, clean, and stocked with Cowshed bath products, that are locally produced. We had multiple TVs if you’re looking to catch up on the news or watch a movie after a long day exploring the city. We loved the modern feature of an automated keypad for entrance to our building and apartment meaning we never had to worry about our losing our keys or keycard. Not that it would have been a problem as they have staff on duty 24/7. We’re big on staying fit so a well-equipped gym with power racks is great. 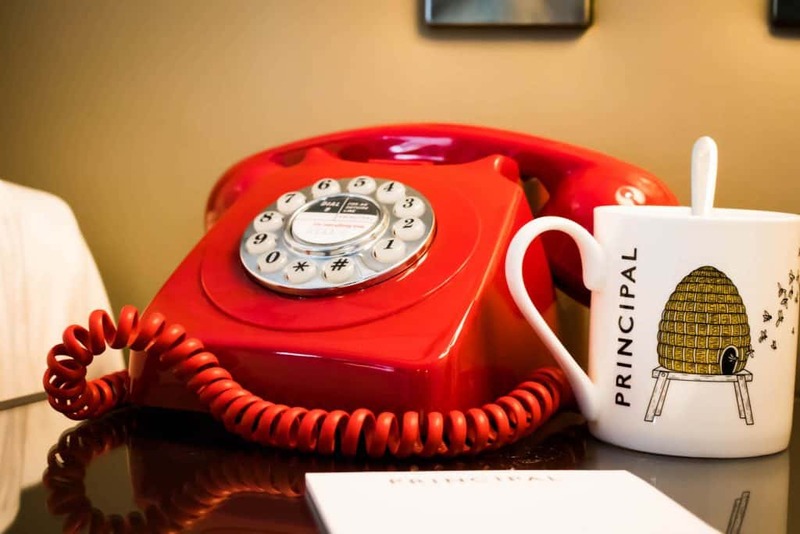 If you’re looking for a home away from home with all of the services of a hotel then look no further! 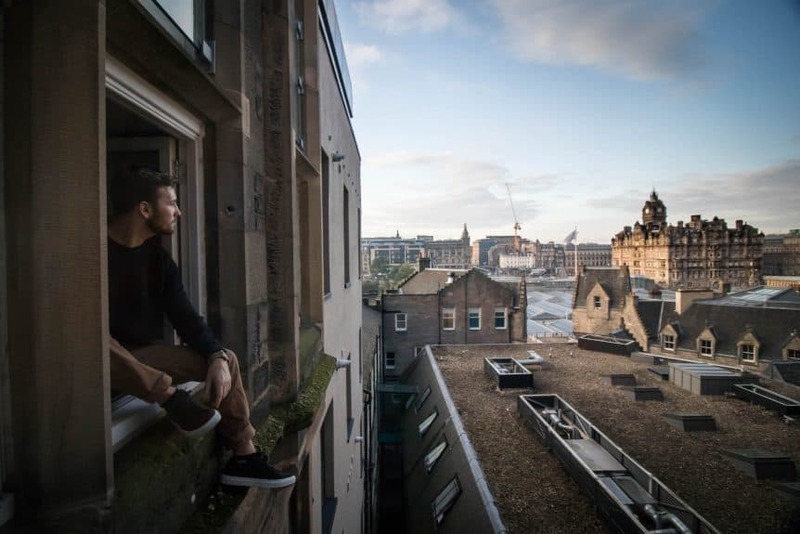 This is a great option if you’re still wondering where to stay in Edinburgh and want to be completely central to all the main sights of the city! 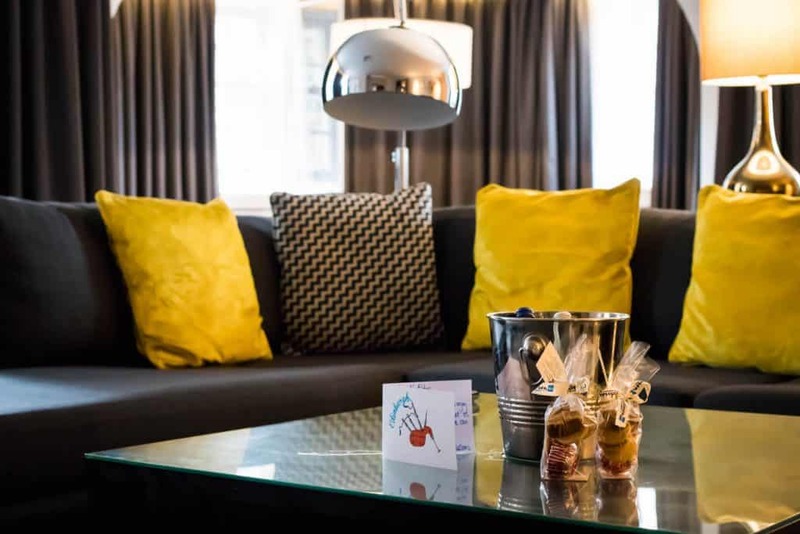 We loved the Radisson Blu in Edinburgh. 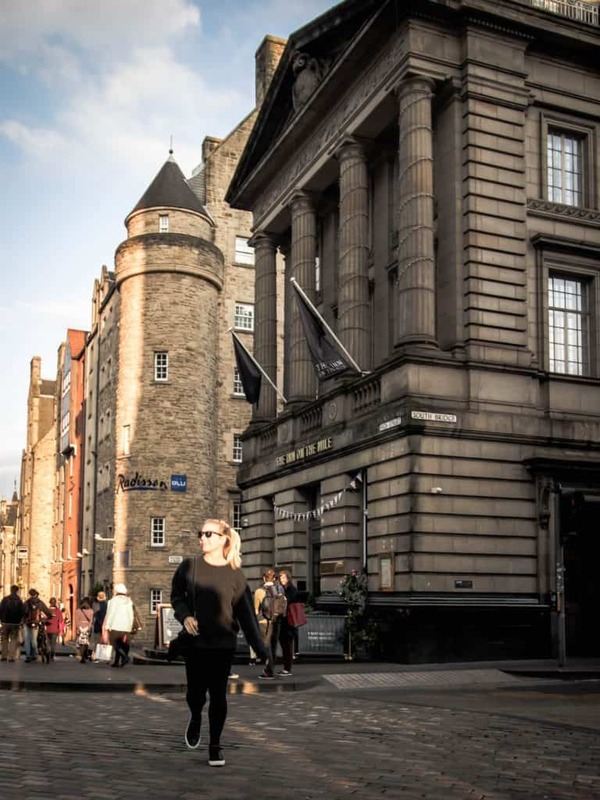 It has one of the best locations in the city at the crossroads between the Royal Mile and South Bridge. The modern hotel may be recently constructed, but it’s made to blend in well with the surrounding buildings. That doesn’t mean it misses out on the past as the hotel sits atop many of cities most notorious catacombs with centuries of history below. We were lucky enough to be upgraded to one of their corner suites. The suite is massive and serves those looking to host a few friends or conduct a business meeting well. While the living room of our hotel was massive we had a detached bedroom with a king size bed. The bed was wonderfully comfortable and came with a pillow menu and a relaxing lavender bed mist. Our night’s sleep here was perfect as the room features blackout curtains and soundproof windows. We loved our stay here as they had a great gym that included everything you could need like machines, yoga mats, bikes, free weights, rollers, and even a heavy bag with boxing gloves. The hotel made for a great stay with its location and high level of service. It served up everything we love about Radisson Blu hotels and did not disappoint. This is actually Edinburgh’s oldest hotel; however, you’d never know it given the hotel’s recent facelift. However, don’t think that means the hotel has lost any of its charm. When we walked into the front door we were greeted by male staff members in kilts and a Georgian era interior. The lobby features marble floors, columns, and has heavy oak and leather furniture. Our junior suite in the hotel was spacious, plush, and cozy. There is a clear attention to detail here and the interior design of the hotel was by far the most stylish in Edinburgh. It served up everything you could want from a luxurious Scottish hotel room. Who can hate on tartan throw pillows? The Burr & Co. coffee shop inside the hotel serves wonderful coffee to be taken seriously and its bar/restaurant are one of the favorites in Scotland. The location is wonderful for those looking to shop and eat while in Edinburgh as it located on the famous George Street. 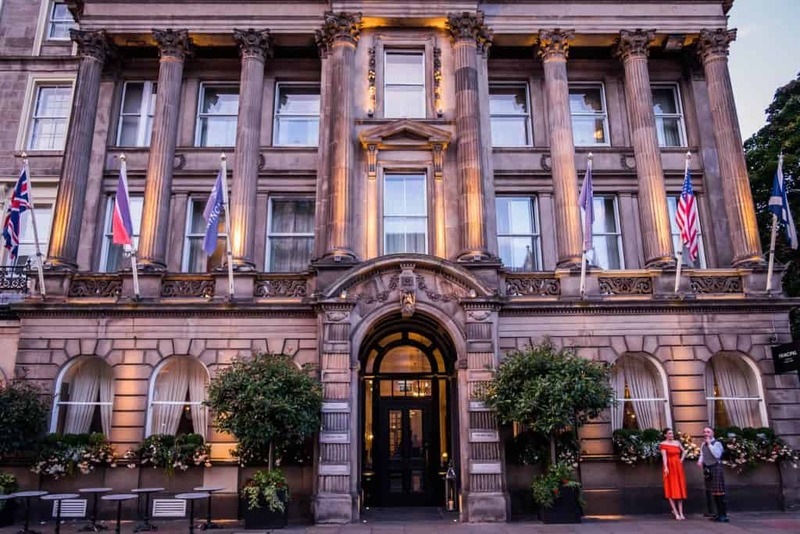 The hotel also received the award for Scottish Hotel of Year award at the 2017 Scottish Hotel Awards, so you know it’s one of the best in the city! The Sheraton is located directly across from Usher Hall. 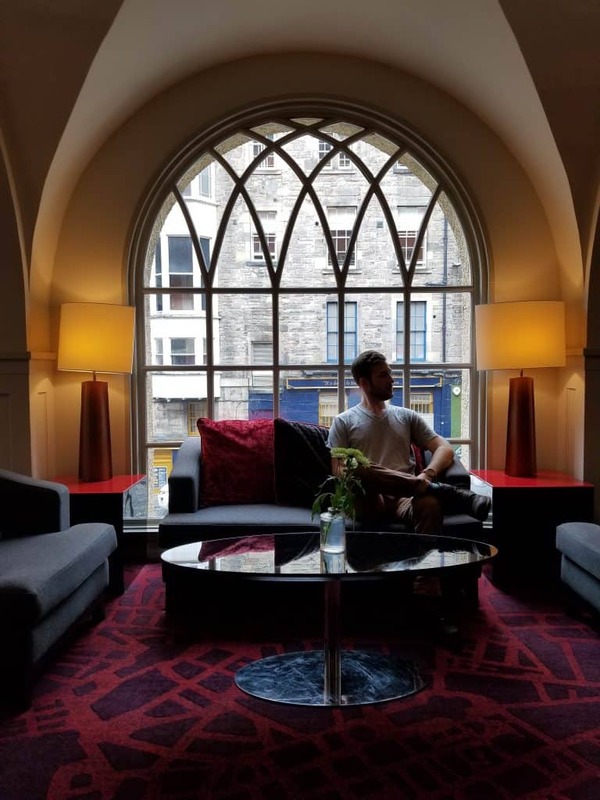 The hotel’s exterior may feel a little drab compared to the rest of Edinburgh, but once we stepped inside we were impressed. The large hotel’s lobby, bar, and restaurant are stunning. Staff at the hotel go above and beyond delivering a high quality of service that is tough to beat. The best feature of the whole experience has to be the spa. The One Spa attached to the hotel just may be one of the most indulgent things to do Edinburgh. It features a rooftop indoor infinity lap pool and sauna for those who like to swim for a workout. Then there is the rooftop outdoor hyrdopool and a full thermal suite with 13 steps of hot and cold treatments. After completing the North Coast 500, we were feeling a little weighed down and the spa rejuvenated us thoroughly. The spa also features a large gym with trainers on site. Rent a Castle View Apartment! We actually love using Airbnb when we travel. We usually opt for own apartment so that we can have privacy and cook our own meals which you really can’t do in a hotel, hence the reason we loved Old Town Chambers so much. I really loved this personal apartment but unfortunately, it was booked when we were visiting. It has castle views, a full kitchen, and 177 perfect reviews – it’s hard to get much better than that. To feel more at home we use Airbnb you can check out some tips and read more about getting an Airbnb coupon code here. Or just take this coupon for your first stay! Wherever you stay I’m sure you will have a fantastic time in Edinburgh. There is so much to do and see and the whole city has this eclectic vibe that is hard to come by in Europe! Here is a little preview of Edinburgh.